Coalition and partner forces are focused on eliminating the remaining Islamic State of Iraq and Syria terrorists in Syria, a top official at Combined Joint Task Force Operation Inherent Resolve said today. An Air Force KC-10 Extender refuels coalition aircraft over Syria in support of Operation Inherent Resolve, March 2, 2018. The KC-10 can refuel a variety of U.S. and allied military aircraft within the same mission. Air Force photo by Tech. Sgt. Anthony Nelson Jr. The Syrian Democratic Forces announced May 1 their renewed push to defeat ISIS, he said. The coalition has since conducted 40 strikes against eight ISIS-held buildings, six logistical assets, two explosive factories and two weapons caches, he added. “This increased defensive action to destroy ISIS marks the beginning of Operation Roundup,” he said. That is the coalition name for the operations “to destroy ISIS in the final areas where they hold ground east of the Euphrates River and liberate the last of their fake caliphate,” he explained. The global coalition of 71 nations and four international organizations remains “absolutely committed to the defeat of ISIS,” he said. The Syrian Democratic Forces are securing the southeast portion of the Syria-Iraq border as part of the first phase of Operation Roundup, Gedney said. The SDF, he explained, are eliminating ISIS resistance and establishing defensive positions in coordination with the Iraqi security forces, which are operating in parallel on the Iraqi side of the border. Meanwhile, coalition forces are supporting the efforts through air, artillery and mortar strikes against ISIS targets, he said. The general noted that the Iraqi air force struck an ISIS headquarters target May 6 near the Syrian border town of Dashisha, further degrading ISIS operational capability throughout eastern Syria and into western Iraq. The total liberated area in the Euphrates River valley is now more than 5,000 square kilometers, he said, an area of more than 1,900 square miles. Gedney highlighted other successes against the terrorists, including an April 29 coalition strike in Dashisha that killed an Iraqi ISIS financial leader. “We and our partners will continue to pursue ISIS and get them off the battlefield wherever they try to hide within our area of operations,” the general said, underscoring that observations in Syria indicate morale is low among the terrorists and ISIS leaders are fleeing. “ISIS fighters continue to surrender rather than face certain death as the Syrian Democratic Forces tighten their containment lines,” he said. 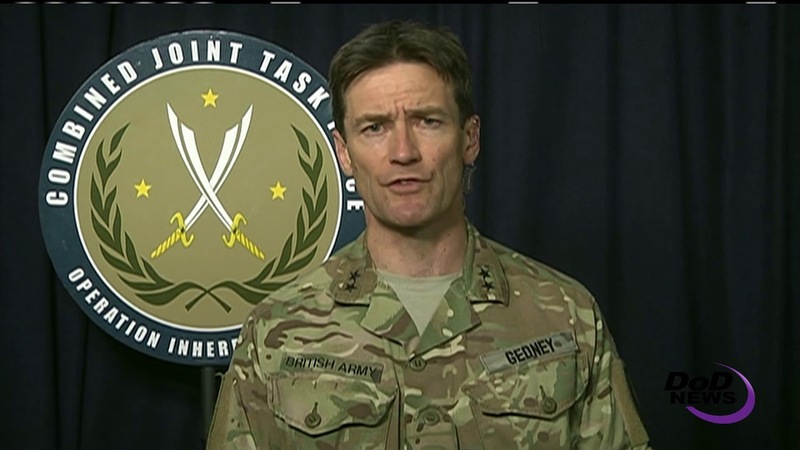 British Army Maj. Gen. Felix Gedney, deputy commander of Combined Joint Task Force Operation Inherent Resolve, briefs Pentagon reporters via satellite on progress in the effort to defeat the Islamic State of Iraq and Syria, May 8, 2018.